Qobit is an all-in-one cryptocurrency investment ecosystem with a strong focus on user experience, social trading and knowledge sharing. The Qobit platform is built with simplicity, functionality, and security in mind. It is an invaluable tool - well suited for both seasoned and beginner investors. Qobit allows beginner investors to enter the highly lucrative crypto assets market with reduced risk and let seasoned traders offer value-added services to their follower base and be rewarded with tokens from their followers. • Trade on multiple cryptocurrency exchanges from a mobile device or desktop.• Store and exchange crypto or tokenized assets in one central wallet.• Subscribe to successful traders' signals where Qobit will mimic the trades for users automatically.• Subscribe to index fund strategies where Qobit will mimic and automate the portfolio allocation for users.• Access to crowdsourced and pre-vetted important cryptocurrency news and signals. 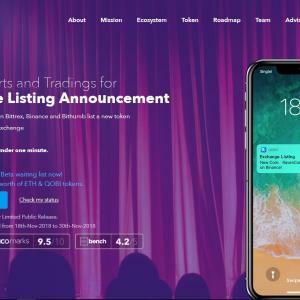 A truly innovative platform, Qobit is meticulously built to serve all types of users, from investors to crypto enthusiasts all the way to active day traders, novice traders/investors and everyone else in between.Qobit aims to democratize cryptocurrency investing and trading, making it accessible and reliable for seasoned investors and new users alike. To date, the crypto investing space is still pretty limited for early adopters and sophisticated investors, Qobitstrongly believes that the rest of the world should be able to participate in this exciting and promising digital economy in a simple and trustworthy way and reap the benefits in a prudent and safe manner.